A range of construction assemblies were selected based on optimised thermal performance and a selection of standard and low impact materials. Eleven different floor assembly variations and 52 different wall assembly variations were considered. 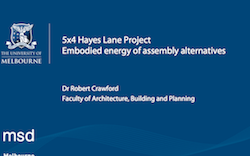 The total life cycle embodied energy of these assemblies was calculated using a comprehensive hybrid embodied energy assessment approach. This included the energy embodied in the materials/assemblies for the initial construction of the project as well as the energy embodied in replacement materials over an estimated building life of 100 years. Average material replacement rates were used. Assembly embodied energy figures were graphed and compared. •	The importance of minimising the embodied energy associated with the building’s initial construction was highlighted. Energy expended in the future (for replacement materials and building operation) is likely to be less carbon intensive than the energy presently being used in the manufacture of materials. It is important that by minimising embodied energy that the thermal/operational performance of the building is not adversely affected. The next stage involves assessing the life cycle energy/carbon implications of a smaller range of optimised assemblies, based on the knowledge gained from this initial analysis. Click on the images below to open the full documents.